The fridge-sized science 'bot the European Space Agency hopes will land on a comet hurtling through space today has successfully separated from its comet-chasing parent craft, Rosetta. Reg Vulture Brid-Aine Parnell is reporting from the ESA ops complex at Darmstadt, Germany, as the story unfolds. The manoeuvre is the first big hurdle on the way to a passive landing on Comet 67P, which now has to take place with one element of the Philae lander out of action. 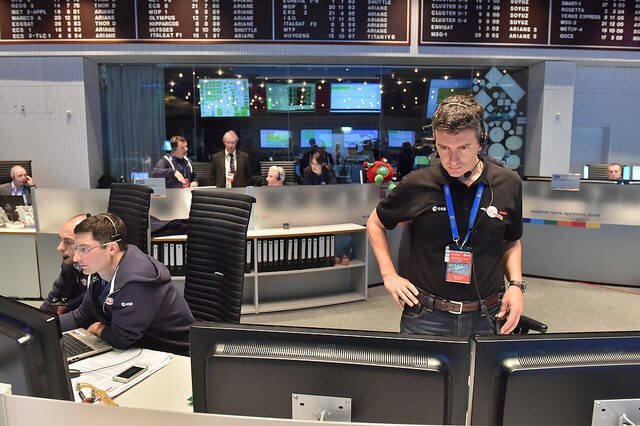 “We’ve been flying together for 10 years, now we see it on the telemetry, Philae is gone, it’s on its path down to the comet,” said Andrea Accomazzo, flight operations director at ESA, who seemed both dazed and happy. Now that the lander has been released by Rosetta, it needs to drift down to landing site Agilkia on the space-rock, a journey of around 22km which should take seven hours or so. Philae’s only landing aids are its harpoons, which will grip the rock when it gets closer, and its ice-screw legs, which absorb the impact of the landing and then drill down into the comet to get a grip. The thruster on top of Philae that was supposed to counteract the recoil from shooting the harpoons is out of action, after a problem with the cold gas system that controls it, but European Space Operations Control (ESOC) decided to go ahead with the launch anyway. Now, there’s no going back. If Philae misses its landing site, it will be pure luck if it finds a clear place to set down, free of the deep pits, towering cliffs and rocky boulders that litter the landscape of Comet Churyumov-Gerasimenko, also known as 67P. Even if it hits on Agilkia, ESA boffins are still unsure exactly what it will encounter on the surface, whether there will be a layer of soft ash over the comet or it will be hard as nails from top to bottom. If it succeeds however, Philae will have made history as the first man-made object to touch a comet and will be the source of reams of scientific data about the space-rocks of our Universe that make up our planets and could be the source of life on Earth. Nasty but nice: gaseous comet innards included water ice! Chilling on –70°C comet, leg stuck in the air... Fancy a beer, friend?